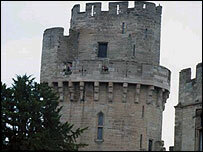 A ceremonial sword has been stolen and a £20,000 stained-glass window damaged during a break-in at Warwick Castle. A gang of three tennagers smashed the window in the vestry to get into a corridor by the main hall. They then broke into a glass display cabinet and stole an 18in (45cm) long ceremonial sword and sheath, but were disturbed by a security guard. The sword was found in the front hedge of a house in the Castle Close area and has been returned to the castle. The three white teenagers, who fled towards the stable car park, were said to be aged 15 or 16. Police said one of the trio could have been a girl. Two wore white baseball caps and blue football tops, one light and one dark, and the third was about 5ft 9in with dark cropped hair. All are thought to have been riding mountain bikes. The theft was on Friday 23 June, but news of the incident has only just been released by Warwickshire Police.